The Milwaukee<sup></sup> M18 Cordless Multi-Tool cuts up to 50% faster and delivers up to 2X more cuts per charge than the competitors. With best-in-class speed and performance, the cordless Multi-Tool offers the versatility to complete problematic jobsite applications. Ideal for remodelers, flooring contractors, maintenance repair technicians and electricians, the cordless Multi-Tool cuts, grinds, sands and scrapes at odd angles and in areas difficult to work. Its powered by the M18 REDLITHIUM Battery (sold separately) to deliver up to 40% more runtime. Use it to make flush or plunge cuts, remove grout, sand in corners and tackle other awkward jobs. The M18 Multi-Tools Constant Power Technology maintains blade speed for faster cutting during heavy applications. The 12-setting dial allows users to match the speed to the application. With the universal adapter (included), the Multi-Tool is compatible with most competitor accessories. It includes 5 assorted sanding sheets. Bosch power tools deliver stronger performance and lasting reliability. The Bosch 24618B impact wrench offers the most compact design for increased maneuverability in tight spaces. Ergonomic grip for extended comfort. Bare tool only. The Electronic Cell Protection is a unique battery pack design that delivers optimal battery life and performance. The spring loaded impact mechanism reduces user fatigue. The built-in LED light is great for dark corners or enclosed areas. Battery and charger sold separately. 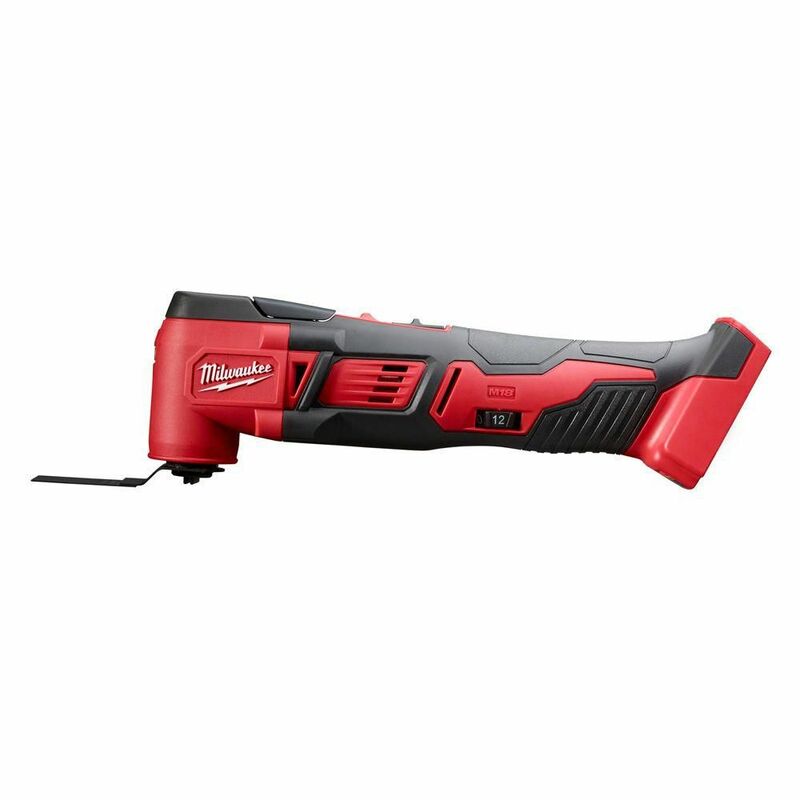 M18 18-Volt Lithium-Ion Cordless Oscillating Multi-Tool (Tool-Only) The Milwaukee<sup></sup> M18 Cordless Multi-Tool cuts up to 50% faster and delivers up to 2X more cuts per charge than the competitors. With best-in-class speed and performance, the cordless Multi-Tool offers the versatility to complete problematic jobsite applications. Ideal for remodelers, flooring contractors, maintenance repair technicians and electricians, the cordless Multi-Tool cuts, grinds, sands and scrapes at odd angles and in areas difficult to work. Its powered by the M18 REDLITHIUM Battery (sold separately) to deliver up to 40% more runtime. Use it to make flush or plunge cuts, remove grout, sand in corners and tackle other awkward jobs. The M18 Multi-Tools Constant Power Technology maintains blade speed for faster cutting during heavy applications. The 12-setting dial allows users to match the speed to the application. With the universal adapter (included), the Multi-Tool is compatible with most competitor accessories. It includes 5 assorted sanding sheets. M18 18-Volt Lithium-Ion Cordless Oscillating Multi-Tool (Tool-Only) is rated 4.7 out of 5 by 490. Rated 4 out of 5 by Skip from I do renovation work and own several Milwaukee fuel 18v... I do renovation work and own several Milwaukee fuel 18v tools this tool has been a great addition to my set, it's got plenty of power and doesn't vibrate your hand much. I give it 4 stars because there's no option for a fuel model just a standard 18v, but still a great tool.